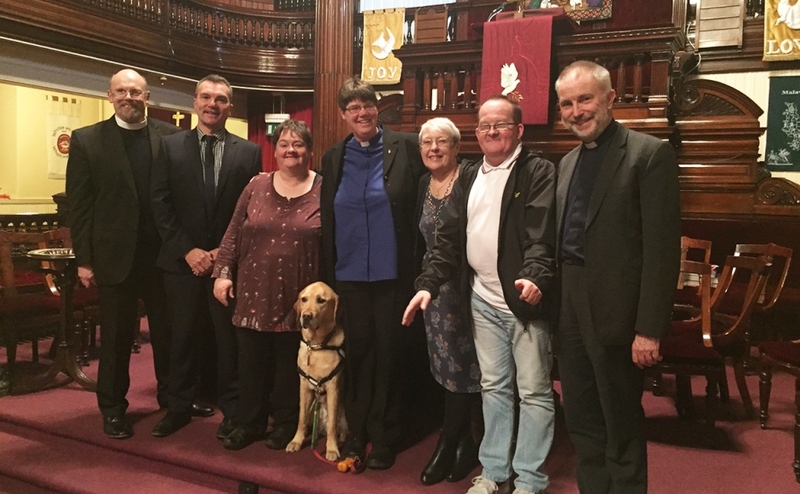 Rev Mary Whittaker, who is the only Deaf* minister across the Church of Scotland, has been inducted as minister to the deaf congregation of St John’s Church in Aberdeen and the North Region of Scotland. Mary, who was originally born in Yorkshire but has lived in the north east of Scotland for most of her life, had her induction service at St John’s Church on Thursday 6 December. Her new parish covers thousands of square miles from Perth to Shetland and Aberdeen to the Outer Hebrides and Skye. “I was in a college for the Deaf when I first visited a Deaf-led church in London. “After two years, I wanted to be a minister but I was advised by a Deaf elder to get life experience first. Looking back, it was very good advice as I was only 19 years old. “Only when one passes through some difficult and challenging moments can one find inner strength and deeper faith in God. It was whilst in Aberdeen that Mary started studying Christian Studies part-time at the University of Aberdeen and completed the Auxiliary Minister Training course in 2011. 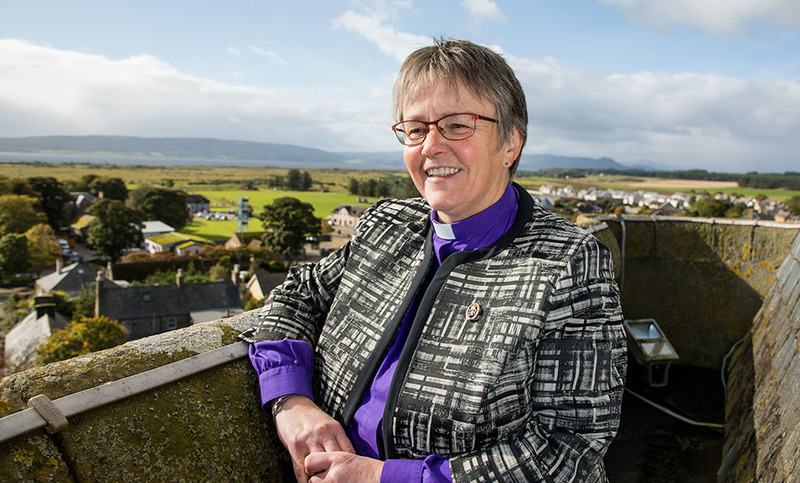 She was then ordained into Lossiemouth as the first Deaf British Sign Language (BSL) user in the Church of Scotland – and is currently one of only two deaf ministers in the whole of Scotland. “A year later, I became a locum for St John’s Deaf Church. I felt a further call to transition into full time ministry but I was advised to go back to the University of Aberdeen for two years to gain a Bachelor of Divinity (BD),” Mary said. “In the same year after I graduated, I started as a probationer minister, mostly with Ferryhill Parish Church in Aberdeen, as well as continuing with St John’s Church for Deaf People and Moray Deaf Church under the guidance of the Interim Moderator – who is able to sign. By the time Mary accepted the role at St John’s Church and the North Region of Scotland, she felt her previous experiences had helped equip her with the knowledge of how to become more welcoming and inclusive to Deaf people in the church setting. “I have had experiences with a hearing church even with an interpreter but it never felt inclusive,” she said. “However, a good example was shown by Ferryhill Parish Church when I became their probationer minister. Mary advises churches to consider that “there is a very wide range of deafness and each person has their own needs. “Many questions can be raised such as the cause of deafness, the age of onset, how severe the hearing loss is, which communication tactics are the best, and the benefit (or not) of using hearing aids. “Deafness is a complicated issue and never assume that a deaf person needs an interpreter (most don’t) or to be given a copy of sermon notes (not helpful if the person also has dyslexia). “Most deaf people lose their hearing and it can be very traumatic for them as the world is full of sounds. “Give them time and work with only one person at a time as each person is different. “Bear in mind that one thing that helps one person may not be helpful for another. Do not be afraid to talk with a deaf person and experiment to find the best way to include themin a service. “Be aware that some of them find it difficult or won’t accept their deafness. Remember to be sensitive and look out or listen for a clue such as ‘I can’t hear you without my glasses’, indicating that this person needs to be able to lip-read as part of a strategy to hear better. Some people have glasses with hearing aid(s) attached, which is also a helpful indicator. Rev Mary Whittaker at her induction service. Mary says, in her new role, she would like to introduce bespoke training such as BSL Awareness training or a basic welcoming BSL workshop in order to help individual churches reach their full potential as an inclusive church for all. “Jesus called us to spread the Good News to all people and that includes profoundly Deaf people who use BSL,” Mary concluded. During her spare time, Mary obtained a black belt in kickboxing earlier this year, and enjoys arts and crafts as well as walking her hearing dog, Scott, during her special moments with God and nature. Scott has been a valuable companion to Mary for over seven years, and has been trained to respond in specific ways to sounds such as doorbells, oven timers, alarm clocks and fire alarms. “He is also a great ice-breaker when I meet new people and usually people come and talk to the dog before me!” Mary added. “Scott normally comes with me everywhere – training courses, church services, pastoral visits, hospitals, etc. “However, not when I’m conducting a funeral. I learned from my sister who looked after him during a funeral and told me that the emotional environment was too much for him and he ‘cried’ loudly. 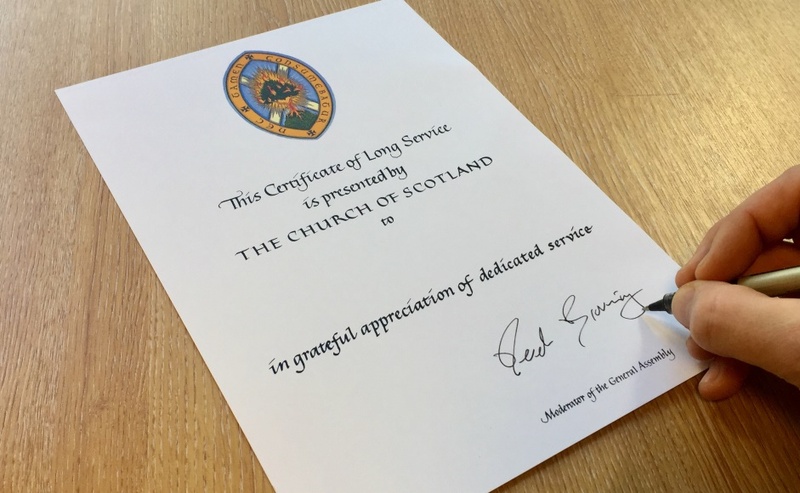 Mary’s inspirational commitment to providing an inclusive space across the Church of Scotland is clear in the advice she sends to other Deaf people who are considering following their call into ministry. “Go for it. Be prepared for the hard times life can throw at you,” Mary said. “It is important to trust in God, even when there are times you feel so far away from Him. “It is essential to have support from your family, friends and your local church to help you, no matter how large or small the situation is. Rev John Ferguson, Presbytery Clerk for Aberdeen, warmly welcomed the appointment of Rev Mary Whittaker. “Aberdeen Presbytery is delighted that Mary has been appointed to St John’s Church in Aberdeen and to the North Region of Scotland,” John said. “Mary brings a wealth of experience to the role and is highly respected among the deaf community in the north of Scotland and beyond. “After a vacancy of around four years, it’s great to see a minister appointed to St John’s who will undoubtedly do an excellent job. “While Mary will clearly be doing quite a bit of travelling, it is intended that full use will be made of new technology, whereby church services will be streamed online for example. Rev Mary Whittaker’s induction service was attended by members of the congregation alongside Lorna Glen, Moderator of Aberdeen Presbytery, Rev Dr Nigel Parker, who led the worship, Rev Rosie Addis, Daran Golby,Partnerships and Development Secretary with the Ministries Council, and the Presbytery Clerk for Aberdeen, Rev Dr John Ferguson. Lesley Crerar acted as the interpreter. *Capital letter Deaf implies those who were born deaf or became deaf pre-lingually and use British Sign Language (BSL) as their first/preferred language.